The Ohanaeze Ndigbo Youth Council, OYC, Monday, hailed former Defence Minister, retired Gen. Theophilus Danjuma over his call on Nigerians to defend themselves against marauding Fulani herdsmen. Danjuma had on Saturday at the convocation of Taraba State University urged on Nigerians to use whatever means at their disposal to defend themselves against killers. His declaration has continued to generate mixed reactions across the country. 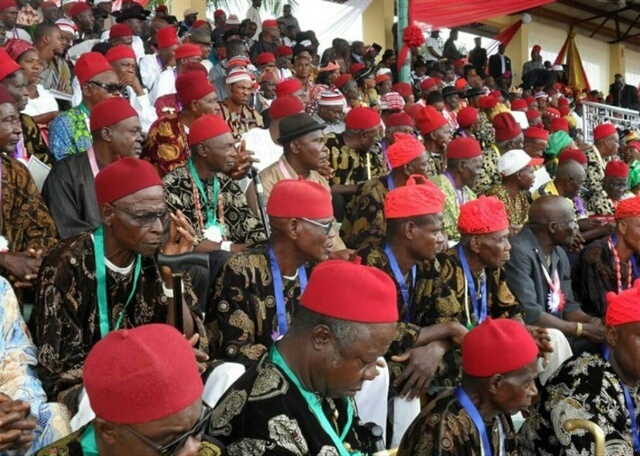 In a statement issued by the OYC, which was signed by its President, Mazi Okechukwu Isiguzoro, he said Danjuma’s stand was a further affirmation of earlier call made the Ohanaeze Youths. DAILY POST recalls that the OYC had shortly after herdsmen attacked Ebonyi State communities, vowed to return fire for fire should such killings re-occur in any part of Igbo land. The group had accused the Federal government of adopted double standard in the handling of the Fulani herdsmen terrorism and Igbo’s non-violent youths agitating for the restoration of the sovereign state of Biafra. “Hence we hereby tell Igbo youths to form rings to guide and protect their communities and farmlands and deal decisively with anybody destroying their farmlands through cow grazing and or bearing arms but he is not a known licensed security person. “We warn that nobody has a monopoly of violence and Igbo nation will surely defend itself. Enough is enough. Any Armed herdsmen sighted anywhere in the South-East will have himself to blame. Arise and defend Igbo land through well recognized vigilante groups,” it had stated on the eve of the Ebonyi attack. Speaking on Danjuma’s call, Isiguzoro said, “it has been our earlier stand; we have been calling for self-defence; so, today we are re-echoing that stand. “Danjuma has justified the position of Ohanaeze Youths worldwide, we will resist any attempt to forcefully Islamize our people; the herdsmen militia, we are ready to resist them. “Like Danjuma clearly pointed out, there seems to be a serious collaboration between the security agencies and these herdsmen. It appears there are two laws in this country- one for the Igbos and another for the Hausa-Fulani. “How else will one justify the recent statements in the media that the government was considering amnesty for the Boko Haram terrorists? It is shocking; it is unthinkable. This is the same government that hurriedly branded the IPOB as a terrorist organization, but same government is not courting internationally acclaimed terrorists. “So, nobody should expect that Ndigbo would fold their arms and these killer herdsmen come here and achieve their evil agenda. We shall resist it with the last drop of our blood. “We have enough men and youths that will resist them before they get into the Atlantic; we urge more Nigerians to speak up; we are proud of some governors in the South-East who have come up to defend the course of Ndigbo.